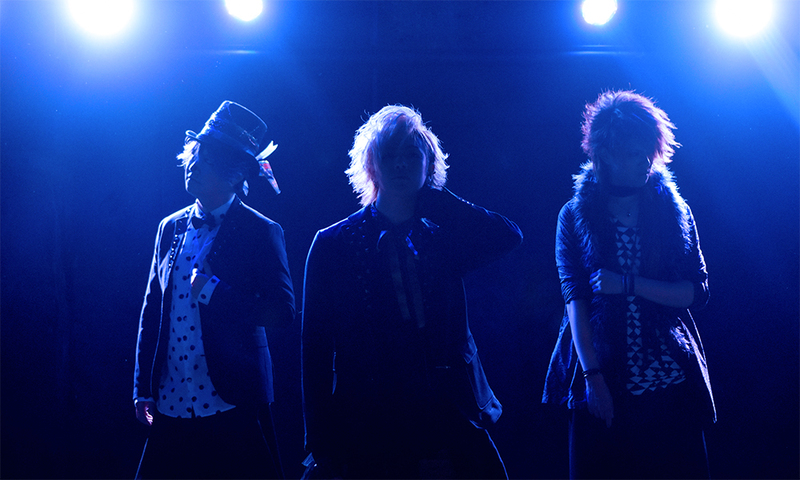 On 24th November at Shinjuku RUIDO K4, WeZ held the second live of their sponsored event tour. Joined by bands from all walks of Visual Kei, and from all across Japan, Tokyo fans were in for an exciting event. Like a parade, WeZ’s opening track danced into to darkness of the livehouse, accompanied by the clapping beat of their fans. The lights began, a riot of colours; a raucous, glitzy opening true to WeZ’s Music Theme Park concept. The bright music guttered, faltered, and was broken by an elfin laugh. The rainbow lights turned to red and the members of WeZ began to appear onstage. Monyo, Yuki and Shiki assumed positions, smiling out to the fans who had gathered to see them. Then Shogo burst onto the scene and the first song began – the upbeat, danceable Zannen x Love. Monyo embraced the enthusiasm of the audience for this vibrant song and danced across stage as the fans moved into a round of oritatami headbanging. WeZ’s playful Theme Park Concept came to life as the audience looked up at the members as one and, to Shogo’s lyrics, all gestured ‘nandeyanen?‘ in time, laughing. Zealous clapping to Zannen x Love’s spirited beat ensued as the lights flashed in classic carnival colours and the members smiled at their fans. Shogo danced on the central box as he invited the audience to ‘boogie boogie all night’, and the fans took up the challenge as the guitar and bass played their quick refrains and the drums resounded brightly out. Monyo skipped to Yuki and played together with the drummer as Shogo joined in with the crowd’s clapping. Then, as the song ended, the unashamedly elated atmosphere of Zannen x Love was splintered by the harder, intense Soul∞Bullet. From the glittering, open gates of the Theme Park, we had moved into roller coaster territory. Fans and Shiki alike moved into hard headbanging, and the lights became fast and furious, losing some of their brighter colours. Shogo stepped up to his box and told the crowd to show him their heart. The drums, the guitar, the bass, the fans were suddenly furious, focused; Monyo and Shiki played with heads down, stances low, pictures of pure intensity. Yuki drummed harder, head bowed, strikes solid, no longer grinning out to the crowd. Shogo drew himself up, flashing confidence, as he told the crowd it was Game Over and shot at them with a finger gun. Even his voice changed, from higher and brighter, to lower and rougher as Soul∞Bullet‘s heartfelt lyrics rolled over the crowd. At the peak of the song, the fans began to oritatami in time to Shogo’s repeated plea for them to wake up his soul bullet, and ended on a single, hard, long note that rang out like the resounding notes from the muzzle of a gun. The song, however, was not yet over, and continued to build with Yuki’s fervor as he drummed out an intense pace alongside the guitar and bass, matched by the furi of the fans. Once the intense Soul∞ Bullet had wound down, Shogo began the night’s MC. He thanked all the bands and fans for coming, and talked a little about each performer they had seen tonight. He interacted with the fans of other bands, encouraging them to have as much fun as WeZ fans and playfully challenged them to try WeZ’s furi. With a final thank-you, the short MC was over and WeZ returned to upbeat and bouncy with Toki no Memory. The lights were red and fast as the fans bounced on the spot in time with the upbeat music, spinning their fingers to the beat. Monyo joined them, skipping across the stage towards Shiki who relentlessly played out the complex chords, before returning to his spot to spin in a quick circle. Then Shogo changed the pace by demanding that the crowd headbang and the intensity of the song began to rise. Monyo drew closer and closer to Shiki, imploring him to go and play, but Shiki sent him away with a laugh as he continued to play the intense, fast notes. Yuki joined him, playing with his heart, lifting each drumstick high before bringing it down upon the drums. As the intensity changed, so did the lights, moving from whirling colour into bright white, flashing once before turning red in a steady rhythm. Monyo directed the crowds as they began to headbang, with Shiki stepping up to join them as he played. The song then changed into a call and resound by Shogo and the track as the fans clapped in time. The other members gathered behind him, around Yuki, to play as a group, showing a firm friendship and solidarity as Shogo riled the crowd from the front. Suddenly, the song ended, and the lights went dark. Shogo let loose with a feral growl and the song Doku ~ Bo Naru Chikyuu no Sakebigoe~ began. The music continued to build as Shogo called for the crowd to shout back at him, fire for fire. Yuki began each beat by lifting his drumsticks high before every strike and Shiki joined him, stepping up onto the box to lift his guitar in salute. Suddenly the pace of the some changed from heavier to light and fast, and the fans matched it, beginning a round of 2-step foot furi. Once more the beat changed into a steady, swinging rhythm and the fans too changed into circular headbanging. Monyo and Shiki sunk lower into their stances and Shogo directed the fans. There was a brief interlude where the song became lighter, the lights matching it by glittering in a host of rainbow colours, and the fans burst into a round of elegant sensu furi. Shogo leapt off his box to interact with the crowd as the song wound to a close. In another change of pace, the jazzy Koakuma Furu Furu began and the whole livehouse moved as one, stepping to the beat in a show of friendship as Shogo asked them, ‘Hey, humans! Can you hear the voices of the demons?’ The song shifted pace with the catchy chorus ‘la la lala la’, and the fans responded, reaching up to the sky and back in time, enjoying the dance as the parade lights sparkled out like the blinking eyes of imps. Just like the demons in the lyrics, the beat swept the fans into the dance, as Shogo sang that they wouldn’t be able to return back to their own world. Shiki and Monyo exuded WeZ’s classic playfulness as they jumped across the stage at each other in time to the music. Yuki laughed as Shiki lost his bottle and leapt backwards at the last minute. Then, the playfulness was put briefly on hold as the solos began and each member showcased their talent. Shogo stepped onto the box, his ringmaster showmanship back in place as he gestured with a flourish at Shiki on his right. Shiki held a brief guitar solo, to be followed by Shogo pointing left at Monyo to cue the bass solo. Then, Shogo threw his head back, arms wide and Yuki’s drums pealed out across the venue. A brief interlude occurred where Shogo leant out to interact with the fans before crouching on his box and welcoming everyone to the demon’s world before letting loose an eerie ringing laugh. The song began to end and Shogo told the crowd it was over yet, but to give it their all for the last. The lights became a bright, sunny yellow as WeZ began their marching song RING!DONG! The fans moved in a flurry of 2-step, bouncing to the beat as Yuki picked up his pace. Monyo and Shiki joined in the dancing, kicking and stepping to the beat. Swiftly, the mosh began, with all members and the fans running right as Shogo still sang, and then everyone sprinted left, to return to their places to march on the spot. Shogo encouraged the fans to keep on walking down their chosen path as everyone stomped in time to the beat. The spirited song entered its final stages as everyone ran right, jumped, and returned. Then at Shogo’s direction, everyone ran left, jumped and returned in a repeating cycle. Fans met the challenge, jumping as high as they could in elation. As the final drums ended, Shogo implored the crowds to bring their friends next time and to keep having lots of fun, as Monyo and Yuki played as a pair behind him. Shiki was still at the microphone, laughing and shouting for the fans to ‘Jump! Jump!’. The song went into its final enthusiastic 2-step as it ended. Shogo left stage after hinting at an encore, as the drums, bass and guitar ended with a finale. One by one they took a bow and left the stage. They had barely finished leaving and the fans started a call for an encore, and it wasn’t long before WeZ answered. Shogo thanked everyone for coming and coaxed everyone closer to the stage for the final song, a WeZ favourite, Baby Bird. The lights flashed like rainbows and Shogo turned his back, marching in place as the upbeat, glittering song so classic to WeZ sounded out. With a call of 1! 2! 1, 2, 3! he leapt from his box and the encore truly began. The fans joined him, all jumping as one body on the spot, only to land and make hearts with their hands. As Shogo crouched on his box to sing out to the crowd, Monyo skipped mischievously over to fold the wings on Shogo’s headpiece down over the vocalist’s eyes. Shogo fought him off, and Monyo returned to his spot, leaning heavily out onto the bars. In a revenge attack, Shiki snuck over and nudged Monyo in the back, trying to topple him over the bars. Monyo recovered and shook his head mockingly at Shiki. Yuki surveyed the fans and the members, his smile obvious even from the back. The brightness of the song changed, and Yuki moved to a fast beat of cymbals as the crowds responded, punching the air. After a round of jumping, Shogo had a brief solo where the fans stayed still to heart him with their hands. That brief interlude didn’t last, and it wasn’t long before the jumping began again. Shiki was beaming out at the crowds and started as Shogo loomed up from his right, directing the guitarist to the microphone. Shiki complied, laughing, and he encouraged the fans to jump. Everyone responded and the mood of the night was definitely elated, even though it was winding down and soon time to return home. Shogo ended the night by reminding the fans of the March Oneman concert in Osaka, and thanking them all for coming. Shiki, Yuki and Monyo all waved their goodbyes as Shogo ended the night by leaning out over the bars and high-fiving members of the crowd before him. WeZ all took a bow and the lights plunged the stage into darkness. This musical theme park was now closed for the night, but still the echoes of their music and the smiles on their fans’ faces lingered, a lasting memory of the night. WeZ’s Oneman will be held in Osaka on 24th March! Don’t miss it! Sensu: Means ‘hand fan’ in Japanese. This furi is where fans cross their hands in front of them before elegantly spreading their arms, looking like an unfolding fan. 2-step foot furi: This is a furi mainly found in Osaka, where you hop on one foot whilst moving the other foot and then swap, creating a bouncing movement, sometimes accompanied by moving arms as if running.